What do you think? Does the atheist person who created this graphic have a good point? I guess that depends on what you think the point is; for me, this graphic (which criticizes Christianity) doesn’t really speak about truth. It speaks about popularity. Consider this: Nazism must be true, because it was very popular with a very large segment of Europe. For about a decade, people all over Germany, France, Austria and other countries were knocking on doors to get into the club. And what about this: smoking cigarettes must be a good thing, since hundreds of millions of people have done it. In fact, there are still young people who knock on the door to get into the smokers club. What I’m saying here is the truth of Christianity has absolutely nothing to do with its popularity. Zero. Zilch. Squat. So let’s go further and explain why people are, for the most part, NOT knocking on the doors to get into the club. It can be as small as failing to give to charity or getting unjustifiably angry with your spouse. And it can be as large as sabotaging a friend’s marriage, cheating on your taxes or defrauding your workplace. The size doesn’t matter. It’s still reality. It’s still bad. It’s still happening all the time. 2. Many people think truth is kinda relative. But there is an objective morality to Christianity – a morality that doesn’t change with time or culture or anything else. Wrong is still wrong, even if everyone’s doing it. And right is still right, even if no one is doing it. And that definitely makes Christianity unpopular. 3. The solution is as simple as accepting a gift from God – Jesus Christ, whom serious Christians believe is His son. Christ came to serve anyone who believes in Him and follows Him – His death is a sacrifice that makes up for all the bad things we’ve done and the good things we’ve failed to do. And His resurrection provides a way for eternal life with Him, long after our lives on planet Earth are finished. This is overwhelmingly unpopular because it forces us to examine our lives and admit we have blown it so often that we can never do enough to make up for it. Even someone as remarkable as Mother Teresa knew that. 4. One final reason for the unpopularity of Christianity? It takes a combination of reason and faith to become a follower of Jesus Christ. It will never, ever be possible to prove or disprove the existence of God. There is certainly evidence, but that evidence MUST be combined with a leap of faith (and I write about that here: http://wp.me/p2wzRb-3i). That’s certainly enough to turn off many people. And yet, in the end, Christianity is so simple. And what you need to do to get in on God’s offer of a changed life NOW and for ETERNITY is remarkably straightforward. Man is a spiritual being in a temporal, human body. When we get spiritual understanding through God’s Word, we begin to understand the things of the Spirit. Which includes the concepts of sin, good and evil. If we choose to pursue God’s Will, we will gravitate to those in whom we perceive the things of the Spirit. If we choose to reject God’s Will, we will gravitate to those who appeal to our fleshly nature. So your atheist friends are partially correct. Not a lot of people knock on our doors. But a few sincere, truth-seekers do. And that is one of the greatest rewards of living for God – when we can help point others to Jesus and the path of salvation and truth. I like this entire post, Frank, but especially gravitated toward your comment regarding how some (most?) people today regard truth as relative. It absolutely is not, but that mindset has twisted and demoralized our American culture and Judeo-Christian heritage. As Christians, we need to stand strong for what is true and unchanging in God’s Word. The cartoon and comment is about respecting other people’s space, privacy and beliefs. 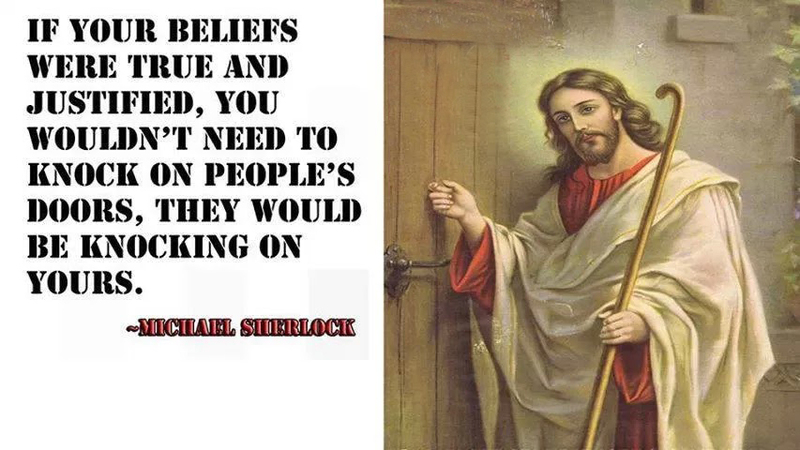 Many people do not want someone else’s belief shoved down their throat. Respect others and allow them to believe what they believe without being so pushy. Thanks for your comment, Karen. Frank’s Cottage does not ‘shove’ Christianity down anyone’s throat. From what I can figure out, you came to this website voluntarily. There’s a larger issue here, however. Jesus Christ, whom serious Christians believe is the son of God, told everyone who follows him to “Go into the world. Go everywhere and announce the Message of God’s good news to one and all.” It’s certainly possible to respect all beliefs while still obeying the direction of our Lord and Saviour. Furthermore, serious Christians believe that once this life ends, every person on this planet, including you, will have to stand before God and account for all the wrong things they’ve done and the right things they failed to do. The FACT that not one person among us can adequately explain away these things means we will be doomed without Jesus. That so many serious Christians can live and interact with non-Christians without caring for their eternal fates is a sad mystery.